Walking dental hygiene students step-by-step through the “how to”—not just the “what” and “why”—of using periodontal and root instruments, this 8th Edition of Jill Gehrig’s definitive resource features new chapters, new online technique videos, updated coverage of the latest evidence-based techniques and equipment, and an expanded array of online teaching and learning resources. 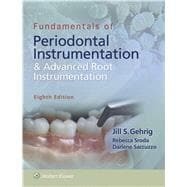 Designed to make it easy for students to learn instrumentation, this practical book first takes students through basic skills—patient positioning, intraoral finger rests, and basic instrumentation—then covers advanced techniques, including assessment of periodontal patients and instrumentation of the root branches of multirooted teeth, root concavities, and furcation areas. Twelve new online videos show students how to perform key instrumentation techniques. An all-new chapter on sub-gingival biofilm management using air polishing devices includes step-by-step instructions for set-up and use of this new technology. A new chapter on dental mirror use provides step-by-step instructions on using the dental mirror in all sextants of the mouth. A new chapter on communication skills includes fictitious patient cases that highlight key aspects of instrumentation, such as word choice when explaining recommended periodontal instrumentation procedures to patients and treatment planning for periodontal instrumentation. New material covers joint hypermobility and the impact of fingernail length on the grasp. New full color photos clarify key techniques. A new user-friendly design on thePoint includes expanded online resources that help students master concepts and skills.